Description: Your base is under attack! Buy defense turrets to defend it. You'll have some money to start with, but use it wisely. You can only build your turrets on ground marked with a grid. 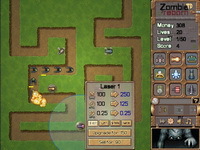 You may also use special abilities to destroy enemies when you are overwhelmed. These abilities cost a lot, so try to use them only when you need to. You can also build walls to block your enemies from passing certain areas. Walls are also great for creating single passages that prevent fast units from moving past slowed units. Good luck Commander!